Mexico's presidential election was too close to call Sunday, with a leftist offering himself as a savior to the poor and a conservative free-trader both declaring themselves the winner. Officials said they won't know who won for days, raising fears of instability and violence. Electoral officials said they could not project a winner, which they previously said would happen only if the leading candidates were within 1 percentage point of each other in a scientific sampling of votes. Luis Carlos Ugalde, president of the Federal Electoral Institute, said an official count would begin Wednesday, and a winner would be declared once it's complete. Fox appealed for calm, telling Mexicans that officials have "complete confidence that each one of our votes will be properly counted and respected." Leftist candidate Andres Manuel Lopez Obrador said he would respect the delay, but went on to give a rousing speech about how he will carry out his presidency. "We will defend our victory," he vowed. "I want the Mexican people to know that our figures show we won." Thousands of his Democratic Revolution Party supporters, waiting for hours in the cold rain in Mexico City's central plaza, began shouting "Fraud! Fraud!" when the delay was announced. Across town, Felipe Calderon of the ruling National Action Party told his supporters that he would also wait, but added: "We have no doubt that we have won." A drawn-out period of uncertainty could rock financial markets and unsettle Mexico's maturing democracy. Preliminary results posted by the electoral institute showed that, with 44 percent of polling stations counted, Calderon had 38 percent, Lopez Obrador 36 percent and Roberto Madrazo of the Institutional Revolutionary Party with 19 percent. Those results were tallied at polling stations, and had yet to be certified. The vote was the first since Fox's stunning victory six years ago ended 71 years of rule by the Institutional Revolutionary Party, or PRI, and it could determine whether Mexico becomes the latest Latin American country to move to the left. Electoral officials said voting was relatively peaceful, although many voters complained polls opened late or ran out of ballots. Ugalde said only eight of more than 130,488 polling stations failed to open — the fewest in Mexico's history. 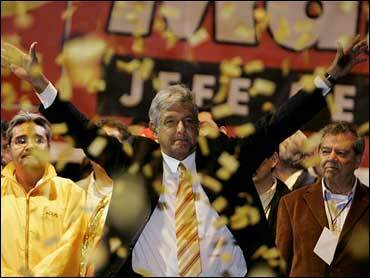 In Guerrero state, two poll workers were shot to death before the polls opened, according to Lopez Obrador's party. Electoral officials said they were investigating, but the killings appeared unrelated to the vote. "We've had an exemplary election day, of which all Mexicans can be proud," Ugalde said. Exit polls indicated National Action did well in three governors races — Morelos, Guanajuato and Jalisco — while Marcelo Ebrard of Lopez Obrador's party easily won the Mexico City mayor's post. As for Congress — key to determining whether the next president will be able to push through reforms — none of the parties received a majority. Two exit polls, both with a 1.5 percent margin of error, gave National Action 35 percent, Democratic Revolution 31 percent and the PRI 28 percent of the lower house of Congress. Carolina Nougue, 35, said she reluctantly cast her vote for Calderon to keep Lopez Obrador out of office. She described herself as leftist but worried Lopez Obrador would govern like radical Venezuelan President Hugo Chavez, and she was turned off by his pledge to put the poor first. "The division isn't between the rich and the poor. It's between the ignorant people and those who think," she said after voting in an upscale Mexico City neighborhood. In Nezahualcoyotl, a slum of 1.2 million people east of Mexico City where infrastructure has not kept up with explosive growth, voting was delayed by flooding from a powerful hail storm the night before. Juana Velasquez, 63, and other residents had to spend the morning bailing water from their homes. "Every year, it's the same. You just vote for someone who doesn't do anything," said Velasquez, who cast a protest vote for Roberto Campa of the minor New Alliance Party. Some simply refused to take part. "We aren't going to vote," said Maria del Carmen, a 24-year-old student marching down Mexico City's Reforma Avenue with Zapatista rebel leader Subcomandante Marcos and hundreds of supporters. "We don't believe in the system and we are going to show our strength." During his campaign, Lopez Obrador accused Calderon of catering to the rich and promised he would govern for Mexico's 50 million poor. Many followed his message like a religion, crowning him with flowers at rallies and plastering their cars with his optimistic slogan: "Smile. We are going to win." Calderon has warned that Lopez Obrador's proposals, including government handouts for the elderly and poor, will bankrupt the nation. Wearing a suit and tie, he showed his right palm before voting Sunday in Mexico City, a reference to his "clean hands" campaign slogan. "It has been a tense, competitive campaign," he said, adding: "Tomorrow, we have to start a new era of reconciliation." All three candidates promised to strengthen relations with the United States while opposing increased border security measures unpopular in Mexico. Mexican law limits presidents to one term, and provides for an unusually long handover of power. Fox will remain in office until December, then retire to his ranch. On Sunday, which happened to be his 64th birthday, Fox gave an ink-stained thumbs-up to prove he voted and said: "I know that there are no Mexicans who want to go against democracy." About 71 million of Mexico's 103 million people were eligible to vote. The estimated 11 million Mexicans living in the United States were allowed to vote from abroad for the first time, but the 32,632 ballots they cast weren't likely to make much of a difference. Thousands who missed out on the new mail-in vote — including farm workers and construction laborers living in California — traveled to Mexican border cities on Sunday to cast their ballots at polling stations.